The Cape Neddick Mission Coffee provides plenty of room for holding your favorite accessories or space for plenty of appetizers for your next party. 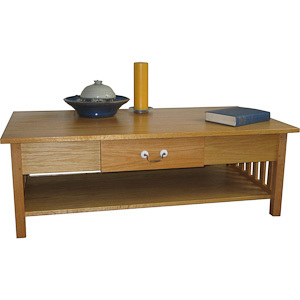 The table shown here was done in oak with a urethane lacquer finish. The overall size as shown is 48" width x 25" depth x 16" height and has a bottom 42" width x 19" depth shelf for additional storage. An optional drawer is available (16" width x 14" depth drawer). The legs and spindles are mortise and tendon with decorative pegs for each leg giving additional strength to the piece.